Smartwatches have been all the rage lately, and no conversation on the topic would be complete without mentioning Kickstarter’s darling, the Pebble. Although it doesn’t have the touchscreen and flashy design of some of its competitors, the Pebble brings a great feature set at a price significantly below competing offerings from Sony and Samsung. After the break, we take a close look at the Pebble and how it works. Thanks to a successful Kickstarter campaign, Pebble has quickly been able to gain momentum and a full-fledged company was built upon the success of the device. Thanks to the solid backing by donors the Pebble was even able to beat the major players (Sony and Samsung) to the punch with an earlier release date (and iPhone integration). 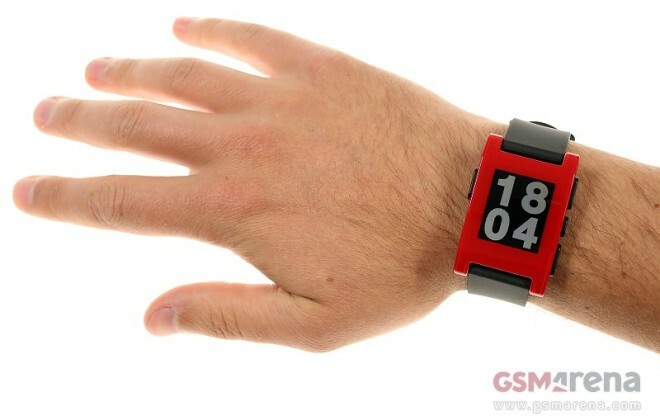 The Pebble features a 1.26-inch “transflective LCD” display of 144 x 168 pixels resolution. Despite its appearance, this is not an e-ink display like you would find on most ebook readers. Still, the screen is of ultra-low power consumption, and the Pebble is rated for up to 7 days of battery life between charges. Speaking of charging, it’s done by way of a proprietary cable that connects to the Pebble’s pogo pins magnetically. There’s no connectivity port of any kind, microUSB or otherwise. Connecting to the Pebble is done only over Bluetooth. While the Pebble does feature a LCD display, it is not touch-enabled. Instead, controlling the smartwatch is done using the four buttons on the sides of the device – Back on the left; Up, Select, and Down on the right. The buttons have a bit too much give for our liking and don’t really sport a premium feel, but are functional enough. The Pebble has an otherwise solid unibody construction that’s not designed to be disassembled like most watches i.e. you can’t open the back panel, for instance. The bendable rubbery strap has the standard metal buckle at the end with 9 holes allowing it to fit it to your wrist. You can change the wrist strap like you would on any other watch. The retail package is a flat rectangular box that’s made of 100% recycled materials and printed with biodegradable ink. It features only the Pebble itself and the proprietary USB cable for charging. There’s no A/C adapter or documentation included. Pebble is all about notifications from your smartphone, and is really nothing more than a digital watch with adjustable watchfaces until you connect it to your device via Bluetooth. It’s compatible with Android 2.3.3 Gingerbread or later, and Apple iOS 5 or later. The differences between the Android and iOS apps are largely cosmetic. Both allow you to customize which type of notifications you receive from your device, as well as download and push new watchfaces to your Pebble. Like most smartwatches currently, the Pebble functionality is limited to being an extension of your smartphone. As such, the Pebble offers notifications for whenever you receive an call, email, or SMS, as well as giving you the ability to read the latter two on the watch itself. Since the Pebble has no microphone or speakers, you won’t be able to dictate or receive calls on it (you can only decline the call if you wish). The Pebble also doubles as a music player extension of your smartphone, so if you’re listening to music on your phone you can quickly change tracks without even taking it out of your pocket. With third party apps that control can be extended to changing the volume and more. The Pebble does feature vibration alerts and coupled with its extensive notifications you could effectively leave your smartphone on silent mode all the time and get alerted of important calls, tasks or messages right right on your wrist. With third party apps you could extend the notifications to include the virtually unlimited number of apps found on Google Play or Apple App Store. We can’t stress enough how much apps are able to extend Pebble’s functionality. Fitness trackers like Runkeeper work great, and the device is easily able to measure the amount of steps you’ve taken, as well as more intense activities like running or swimming (the Pebble is waterproof for up to 50m). There are also apps for a wide variety of uses, including a bicycling app that displays speed and distance, and even a bearing and distance app used for aviation. The Pebble’s usefulness is a quite standard for the market niche that is occupied by smartwatches since their relatively abrupt appearance. As technology has not advanced to the extent that we can effectively create smartphones which can fit on your wrist, this first generation of smatwatches are more the kind of rudimentary devices that are hopefully paving the way for more capable offerings in the future. That said, the Pebble does warrant a look as something more as a mere placeholder device for better things to come. If you find the process of taking out your cell phone, unlocking it, and browsing to the relevant app whenever you want to read a text or change the track on your music player a repetitive and time-consuming task, then the smart watch could save you a significant amount of time and hassle. With vibration alerts right on your wrist, missed calls, alarms and notifications will be effectively eliminated. Compared to other smartwatches, though, the Pebble does have its shortcomings – the most obvious being the screen. The fact that it’s a monochromatic display isn’t as big an issue as the fact that it’s not a touchscreen. Third party apps are able to significantly enhance the Pebble’s usefulness, but they become hindered by Pebble’s reliance on hardware buttons for navigation and input. We are also not particularly fond of its overall build quality with the glossy plastic and cheapish looking rubber watch better suiting a $20 dollar watch than a high-end one. Finally, the large screen bezels don’t help much either – at around 6mm on each side, that’s about 50% lost screen estate on just the 21mm horizontal length of the screen. The good news is, the Pebble is rated for around 7 days of battery life, and a more capable screen could reduce that significantly – not to mention increase the price. Ultimately, like a smartphone, the Pebble is as useful and capable as the apps which support it. If smartphones are any indication, the sky’s the limit when it comes to the possibilities provided by apps and the Pebble was quick to open to third-party developers and that will hopefully help it get even better in the future.